Egypt Temples - HISTORY'S HISTORIESYou are history. We are the future. ​2. Beliefs: Why do people live the way they do? A dwelling is a place where one lives. A dwelling place could be a tent, a cave, a house, or a palace. A dwelling place is any place you call home, a place where you routinely return to sleep and live. In your last lesson you learned about ancient Egyptians tombs and a special type of tomb reserved for royalty, the pyramid. Pyramids were afterlife homes for Egyptian pharaohs. The cities that developed near the pyramids held real life homes for those ancient Egyptian workers and priests who cared for the pyramids. Knowing what you know about Egyptian beliefs and the afterlife, you would be correct to call tombs the homes used by the ancient Egyptians in their afterlife. In this lesson, building on what you know, you will learn about another place that many ancient Egyptians called home, the temples. Ancient Egyptian Temples: Just as pyramids and tombs were dwelling places for the Ba and the Ka, the two sides of the soul of deceased ancient Egyptians, temples were dwelling places, homes, for both the living and for the gods and goddesses they worshiped. There was very little reason for anyone to visit a pyramid-city. In fact, unless you worked there as a worker or as a priest caring for a pyramid, you would have little reason to be there. The temples were different, however. While each temple was built to honor a god or a goddess, the temple, once built, was a common hangout, bringing people together for a variety of reasons. Indeed, temples were where the Egyptians, including the Pharaoh, would go to worship their gods and goddesses. However, they were also commercial centers for cities large and small. Other ways in which the temple served the community included providing meeting places for government to conduct business and serving as centers for learning. Temples were also places to gather, to linger, to "dwell," as it were, for members of the community. As such, the most important role played by Egyptian temples was a social one. Whether the temple was a huge beautiful place built in the heart of one of the major cities or a small isolated place built to honor an obscure deity, all temples were the center of ancient Egyptian daily life. Unlike the pyramid-cities, the temple-cities were the heart of each community. What are the two types of Egyptian temples? The Earliest Temples: While the greatest Egyptian temples were built during the New Kingdom, the earliest Egyptian temples were built in the shape of reed huts in the middle of the 4th millennium BCE. The last construction of an Egyptian temple was the Temple of Isis at Philae. Begun during Greek Ptolemeic rule, it remained in use until the 6th century CE when the Roman Emperor, Justinian, closed it. Not surprisingly, then, the architecture of ancient Egyptian Temples covers a huge variety of different structures that evolved over an enormous period of time. Even so, Egyptian temples share numerous traits. 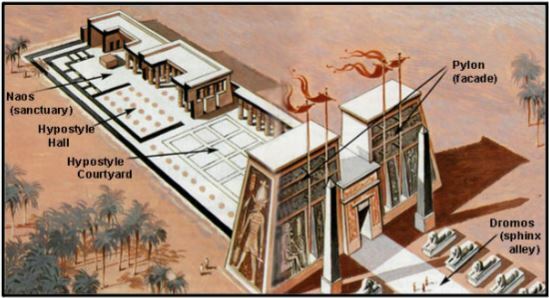 Egyptologists divide Egyptian temples into two separate types. By the time of the New Kingdom Period in Egypt, roughly 1500 BCE, the two principal types of temple consisted of cult temples, known as “mansions of the gods” and mortuary temples, known as “mansions of millions of years”. Cult temples were dedicated to the worship of the gods of Egypt - Amun, Ptah, Horus, Osiris, etc.— and were designed to house their images. In a mortuary temple the object of worship was the deified pharaoh. Large temples were built of stone so that they would last forever. The two great temples of Thebes, Luxor (pictured above right) and Karnak, employed 90,000 workmen, and had 400 orchards. Also in their possession were 80 ships, 50 workshops, and over 500,000 head of cattle. They were so large that in order to pay their bills they taxed 65 townships across Egypt. There were smaller temples, too, temples that employed as few as four workmen, had perhaps just one orchard, one ship, three workshops, and a few head of cattle. Big or small, the temples served a similar purpose in each of their locations. They were the spiritual, social, and economic centers of their communities. 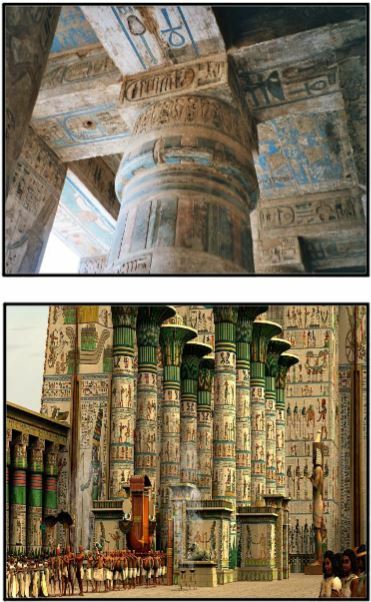 Egyptian temples are a physical representation of what story? Architecture of the Gods: While the details of each cult temple were unique to its location, all temples shared similar design components. In your lesson on ancient Egypt religion, you learned a creation story that told how Egypt rose from a vast ocean as a mound of earth and that it was on that primeval mound that life began. Essentially, the temple complexes, like the pyramids of the Old Kingdom, were meant to be physical re-creations of the mound where life began. When it comes to Egyptian temples, that same theme is played out frequently. One of the highlights of the Egyptian year was the festival of the local deity. The exact layout of the local temple, therefore, was largely determined by the requirements of ritual and ceremony that the celebration demanded. At the heart of these ceremonies was a great procession in which the god emerged from his temple, just as life emerged from on the original mound. However, the temple was also the home of the god it honored and, in that respect, functioned in pretty much the same way as any noble household. The god had to be fed, so there were kitchens and dining rooms in the temple. There were also robing rooms along with plenty of closet space and vaults full of jewelry. What three design features characterize Egyptian temples? The standard Egyptian temple consisted of three parts - an outer courtyard, a hypostyle (or columned) hall, and the sanctuary itself. In larger temples those elements could be multiplied. Generally, auxiliary rooms such as meeting rooms and school rooms surrounded those three main parts of the temple. Collectively, the buildings created a temple "complex." A common addition to the temple complex was an enormous gateway known as a pylon. The pylon served as the entrance to the courtyard and provided a more grand approach to the sacred space within. All of the elements of an Egyptian temple were arranged along a single avenue of approach, ideally tracing the pathway of the sun, running east to west and facing the Nile. The design was meant to serve as yet one more reminder of the time of Creation. The columns of the Hypostyle Hall were carved in the shape of lotuses, lilies and papyrus plants, a reproduction of the marshes surrounding the temple. The sanctuary in the temple complex played a special role in the architectural retelling of the Egyptian creation myth. The sanctuary was higher than the rest of the temple and represented the mound of creation. Typically, the floor level rose as you moved from the entrance to the front of the sanctuary. At the same time, the ceiling got lower and lower. Approaching the image of the god housed at the front of the sanctuary, you would move from the bright sun beating down on the open courtyard, through a rather dimly lit hall to the complete darkness of the claustrophobic sanctuary. The effect heightened the sense of mystery and awe associated with the gods. How did Egyptians feel about their gods? Gods Were Loved: In each temple, the courtyard or the land around the temple was teeming with people. The faces of the people showed no sign of fear. People loved their gods, and honoring them was a joyful thing. When visiting a temple, women wore jewelry jangling with bangles. They brought temple offerings of food and goods they had made such as freshly baked bread, crisp vegetables, and woven baskets. When the ancient Egyptians asked the temple god for something, if they did not get it, they might whip the statue of their god, just a bit, to let him or her know how they felt. They did not fear their gods at all. Each year a festival was held to honor the god associated with the temple. During the festival, the god left the sanctuary to travel through the streets of the city and visit the other gods. In this procession, he was carried in a sacred boat on the shoulders of his priests, gliding through the sacred swamp to receive the adoration of his worshipers. It was a big deal. Name at least three types of people who called the temple "home." Inside the Temple Complex: Along with the statue of the god the temple honored, temples also housed schools, visiting diplomats, priests and their families, scribes and accountants, and a host of farmers, craftsmen, and laborers. School was conducted in the temples. 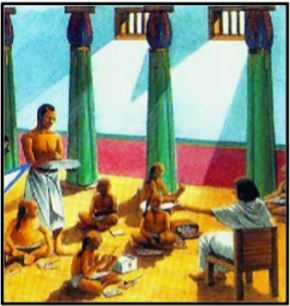 Like so much of the ancient world, school in Egypt was for boys only. At day's end boys in short tunics poured out through the temple's gates, carrying their writing blocks and pen cases, slapping and punching each other, and laughing. The beleaguered and exhausted scribe who was in charge of them might reach out and cuff an ear or two to quiet them down as they pounded out of the temple complex. Inside the temple wall, it was not an unusual site to see a visiting diplomat from another country or another city scurry by with his secretaries hurrying behind him. Of course they brought gifts, sometimes quite exotic gifts for the temple god. Their gifts acted as payment for their stay at the temple. Priests in ancient Egypt were married. So, the temples were not only symbolic homes to the gods, they were also very real homes to priests and their families. In addition to serving as homes for priests and their families, temple complexes housed temple staff and their families as well. Every single square inch of temple space was painted and colored and decorated, from floor to ceiling. The ceilings might be as high as 190 feet! In the interior courtyard, it was likely that wooden planks were everywhere. It would not be uncommon to enter a temple and see gangs of workers laughing as they worked with one another from dawn to dusk remodeling the temple. Repairs and remodeling was an ongoing job. The workmen were part of the temple's staff. As temple staff, the workmen liked to keep busy and active. It was an honor to be chosen to work as a member of the temple staff. Temples also hosted the granaries, the storage places for food. They had rows of beehives to produce honey that the ancient Egyptians used to sweeten their food. They had people whose job it was to care for these storage and production centers. They had people whose job it was to write everything, both scribes and accountants. 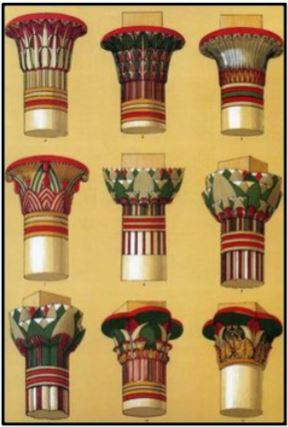 They needed artists, along with other craftsmen, to create the many paintings and decorated pieces of pottery used to supply the needs of the temple and its many residents. Brainbox: What are some similarities and differences between ancient Egyptian temple life and common contemporary church practices?